Mykonos is a Greek island appreciated for its paradise beaches. Most people know well how relaxing stay a few steps from the sea and becoming immersed in pure relaxation; all this and much more will find on this enchanting island. The beaches in Greece not to be missed are many, particularly the coasts of this area are fabulous, characterized by brown hills surrounding the bays and white houses built in Cycladic style. All the beaches are well equipped: ideal for those who want to dive into the crystal clear sea or for those who love nature, you can go here and discover wild and isolated areas. 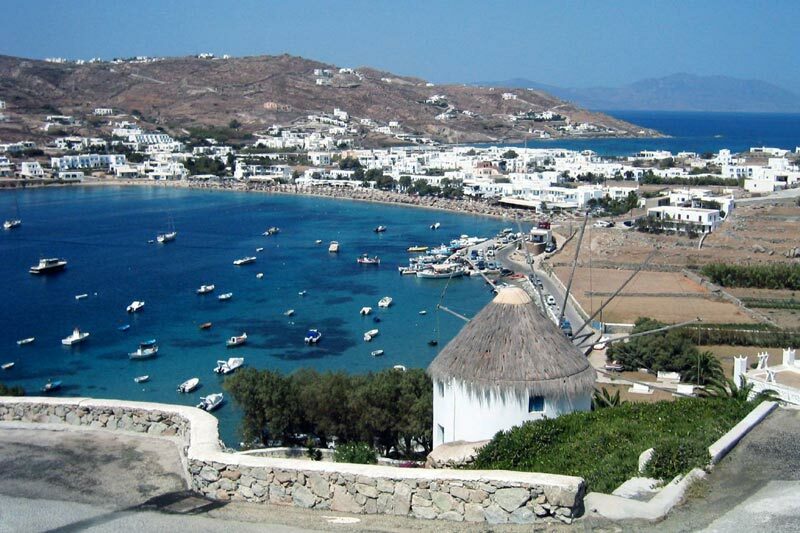 Evaluated not only the beaches, but also hotels in Mykonos and all available offers. The most famous beach in Mykonos and appreciated, this is the perfect place for those in search of fun. The boys just love Paradise Beach and endeavor to return every summer: music and discos reign supreme both day and night and all year. The beach is located in the western part of the island not far from the beaches of Paraga and Super Paradise Beach. It is often frequented by nudists who are attracted by the endless nights and rich music. By day, however, most sports can do water sports or diving tours. Love worldly places, well connected by many means of transport that allow you to get married between the various resorts and beaches of Mykonos? This is the perfect place for you. Beach feature and liked for revelers at night, in the morning the bay is very quiet, perfect to enjoy a little ‘relaxation. So if you want to relax choose the early period, because in the afternoon they start to show a bit ‘of people and nights are always marked by the rhythm of music festivals. The place is known to be very popular and appreciated by the Gay, who find themselves on the right side where there is also a club with a pool. Super Paradise Beach is open to the then nudism, if you do not appreciate this choice, you can always decide to opt for other beaches. This is the most alternative and anti-conformist beach on the island: the nudist party are great and the crowd is completely without clothes. On the eastern side of Mykonos a few steps from the village of Ano Mera, the beautiful Elia beach is considered the longest. The whole stretch of golden sand and fine is equipped to best accommodate thousands of people. Tourists love to practice here water sports of all kinds and, for this reason, celebrities are often near Elia. Another coastline open to gays and nudists, near this beach you can stay in luxury hotels, rental apartments and small family hotels. Excellent restaurants within easy walking distance from one of the main attractions of the area, the island’s only water park. 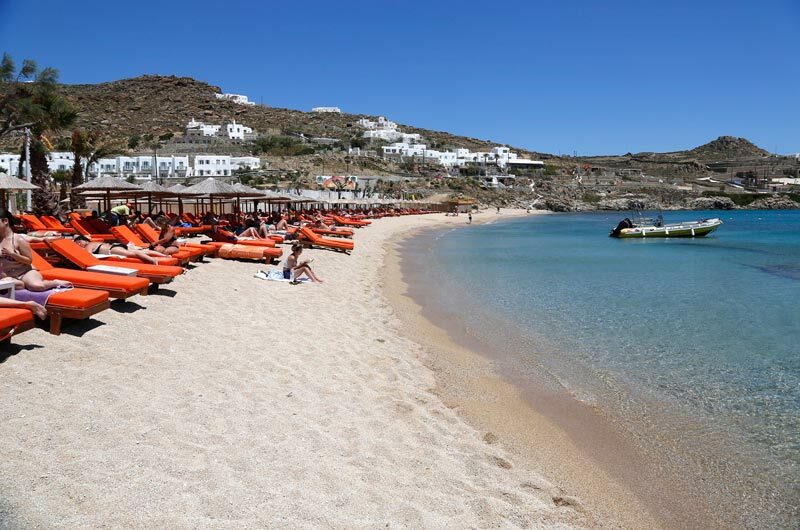 Compared to other beaches of Mykonos, it is a carefree and uncrowded area, the perfect choice for all tourists who enjoy the quiet atmosphere and some privacy. A little further away, Agrari beach where they hide two very popular beaches among gays. Married to the south-west coast of Mykonos, here is the beautiful Psarou white sand, the beach is not great, but well sheltered from the winds. The luxury hotels are many and there are restaurants to suit all types of customers. According to many it is the best beach in terms of services offered, thanks to the presence of some schools of diving. To get there just take the bus or get there by car, bike or boat. 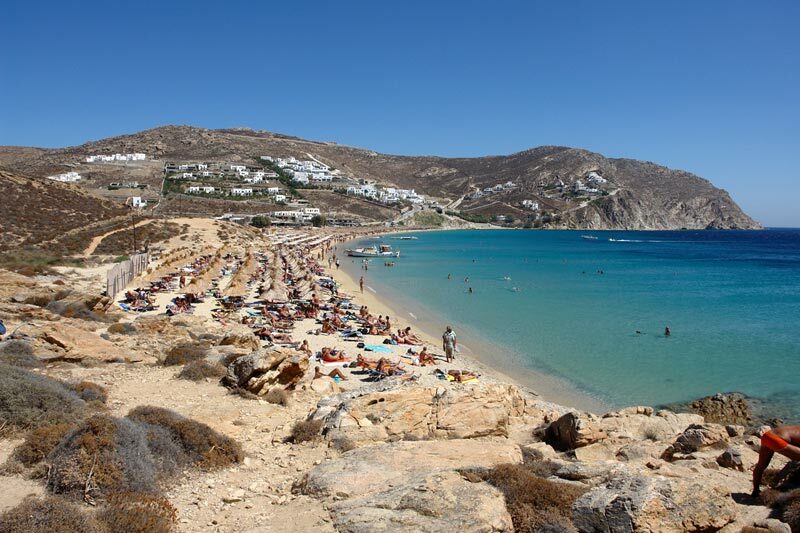 Just go to the south-west of Mykonos to find one of the busiest areas and developed for tourism. Faced with this resort is the Korfos Bay where you can go windsurfing. Near the beach of Ornos is no shortage of luxury villas and high-end hotels. Strolling through these amazing beaches or dive into their crystal blue sea will not disappoint your expectations for sure.